Mozilla on Monday announced that it has added a new feature to a pre-beta build of its Firefox browser, known as “do not track”. While the feature is a “nightly build” which means that the browser feature is for testing purposes only, with a warning note that it might contain some issues. Just a week back, Mozilla had released details about the feature to be added to its upcoming version of the Firefox web browser, release 4.0. Adding this feature to the browser would give access to net-surfers, who don’t want to be tracked by Internet marketers. 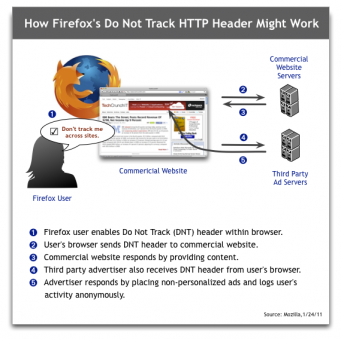 To enable this feature, users need to open the preference pane in the software, select the advanced tab and click the box with caption “Tell sites I do not want to be tracked.” After setting up the feature, each time you visit a web page, the browser will send a signal, “don’t track me” to the site. Other than that, Mozilla is not the only browser adding this feature to its browser. Google also has plans after the Federal Trade Commission unveiled a broad plan for online privacy. Now thats a great help. May be a way to anonymous surfing..